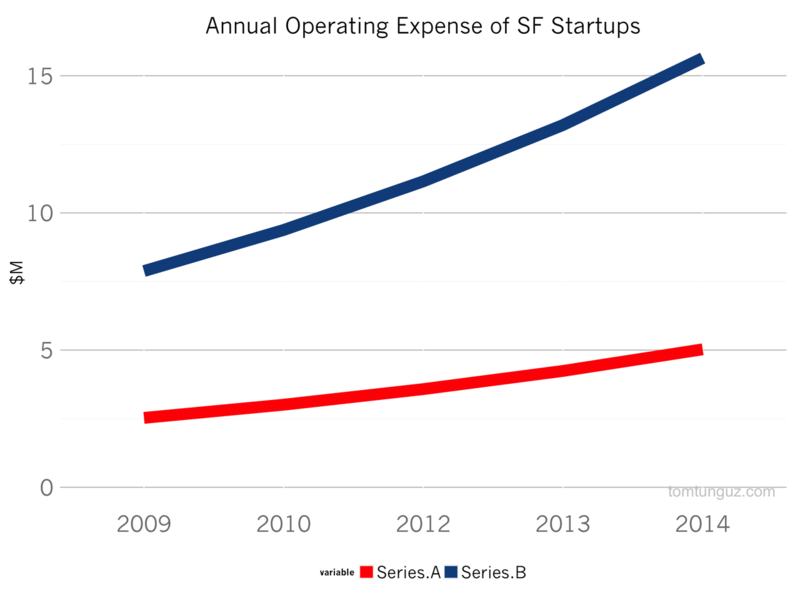 It’s becoming more and more expensive to scale a startup in San Francisco. 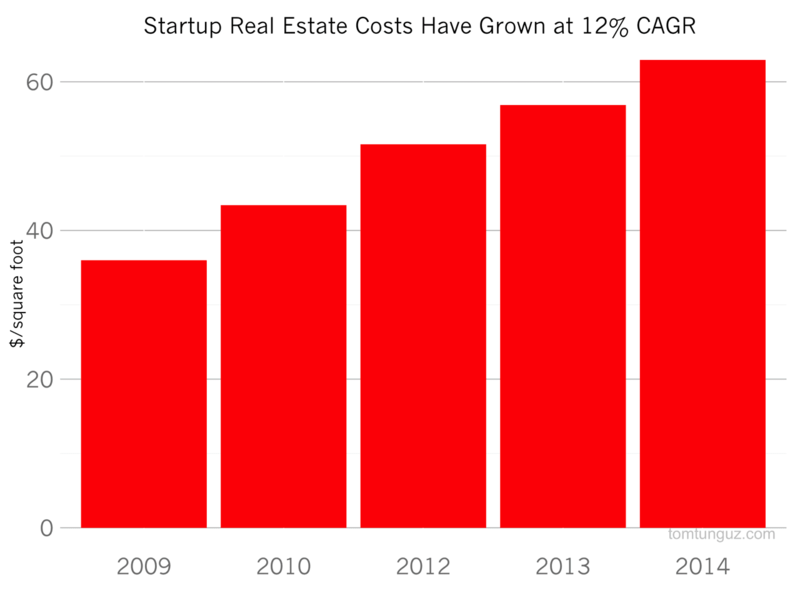 In fact, it’s twice as costly to operate a startup in 2014 as it was in 2009. According to data from Jones Lang LaSalle, office prices in San Francisco have nearly doubled in five years from $36 per square foot per year to $63. Typically businesses allocate about 150 square feet of office space per employee. Given the market rate for office space and annual salaries, hypothetical 20 person Series A startup will spend about $200k per year per employee in 2015. In parallel, startups and incumbents vying for talent in the increasingly competitive job market have bid up the median wage of a San Francisco technology worker 15% each year, from about $90k to well over to $180k in 2014. Wages include salary, benefits, stock options and perks. Wages constitute the majority of the increase in startup expenses. Real estate costs add only 5% of per employee costs. 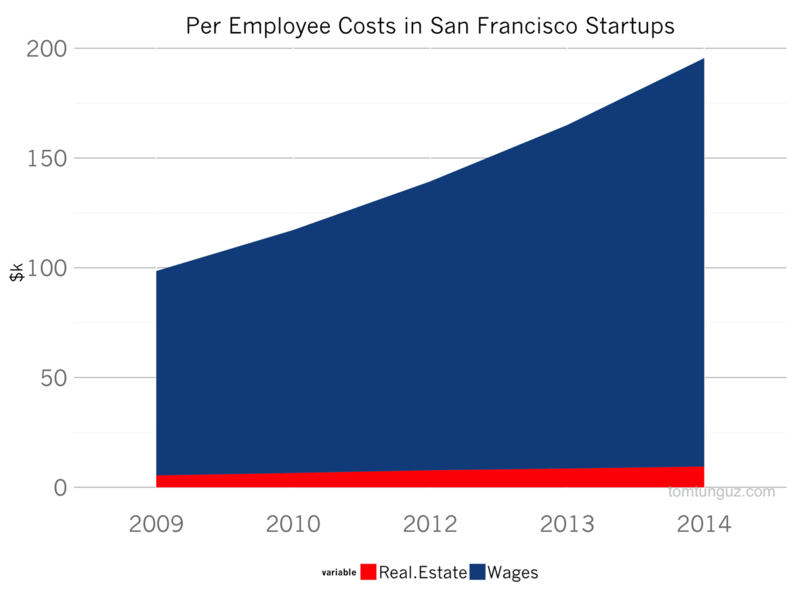 The combined inflation of real estate and wage costs have a dramatic impact of the operating expenses of startups. The chart above compares the op-ex (excluding marketing spend) of a hypothetical 20 person Series A startup and a hypothetical 80 person Series B startup over the past five years. In both cases, the op-ex figures double from $2.5M to $5.0M and from $7.9M to $15.6M respectively. The cost savings startups achieve from cloud computing infrastructure or other technology cost reductions are dwarfed by the steady cost increases of labor in particular. These heightened costs of doing business may explain some of the increase in startup round sizes. 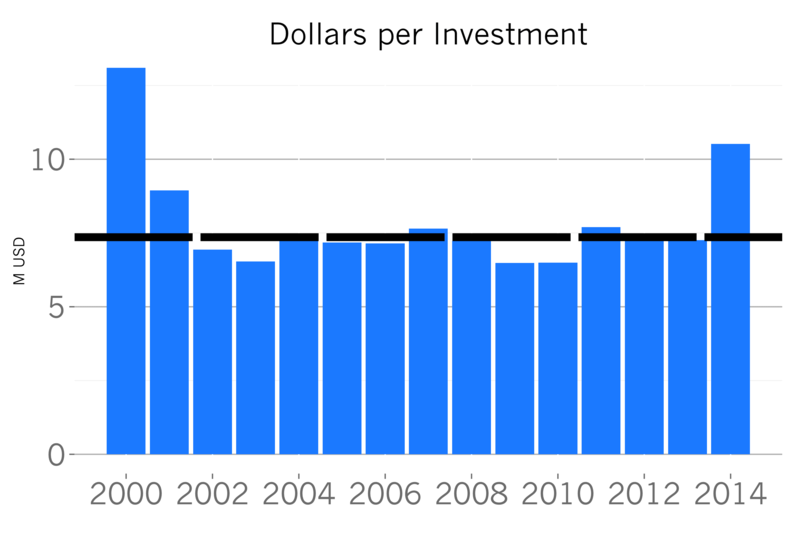 Of course, 2014 was the best year for venture fundraising in more than a decade and more venture dollars pursuing more startup opportunities in the Bay Area means even greater demand for top talent. It’s quite likely that the substantial injection of venture dollars into the ecosystem are creating the market dynamics that increase startup costs. Consequently, it’s not unreasonable to expect wage inflation and consequently higher startup operating costs to continue.